I don't understand how an almost 3-month old can have nicer brand-named clothing than his parents. Don't get me wrong, I am extremely thankful for every gift he has received. However, can we say SPOILED? Speaking of spoiled.. HJ and I bought BJ something as well. hahaha. We bought him a BebePod! 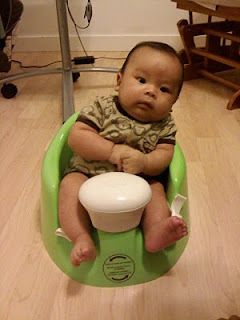 For those of you who have heard of a Bumbo , these BebePods are pretty much the same thing. It is a chair that allows baby to sit as soon as he can hold his head up. I don't know when babies are supposed to be able to hold their head up, but BJ started being pretty good at it at 12 weeks old. (He's 13 weeks tomorrow.) His head is still a little wobbly so I sit right beside him when I put him in his chair, but the chair works for us. The only thing I worry about is that the way this chair is made, BJ could possibly push himself forward and hit his head on the white part of the chair. Not sure. I guess I just have to supervise him and make sure he doesn't do that. For the most part, he really likes his chair. He looks like such a big boy! I guess he is. What happened to my infant boy?